Despite extracellular immune surveillance, viral and bacterial pathogens are still able to infect cells. This means each cell must have its own mechanisms for directly restricting pathogen replication. It is this process of intracellular immunity that my lab is interested in. We take a hypothesis-driven approach and investigate infection from both the host and pathogen perspective. The evolutionary arms race between the two continues to provide some of the most unexpected and fascinating discoveries in biology and these insights form the basis of future medicines and therapies. Figure 1: TRIM21 is the highest affinity antibody receptor in mammals. It intercepts antibody-coated viruses in the cytosol and mediates their proteasomal degradation to prevent infection. 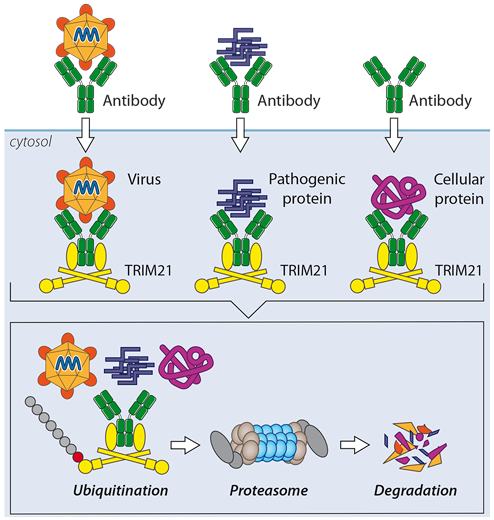 TRIM21 has an unusual mechanism of ubiquitination that allows it to target any antibody-bound molecule for degradation, including proteopathic agents such as tau or cellular proteins. One of our key discoveries is the cytosolic antibody receptor TRIM21. TRIM21 is expressed in every cell and combines innate and adaptive immune mechanisms to protect us from infection. TRIM21 mediates the rapid proteasomal degradation of viruses, pathogenic prions and even cellular proteins. This latter activity we have exploited in a technique called TrimAway that allows rapid and specific protein depletion in any cell. We utilize a wide-range of techniques from biophysics to cellular and in vivo models of infection. In this way, we hope to understand how function is transmitted from molecules to cells. 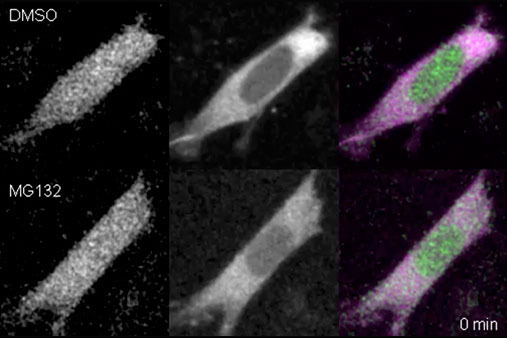 Movie 1: Cells expressing TRIM21 and GFP are microinjected with anti-GFP IgG antibodies. TRIM21 rapidly detects the GFP-IgG complexes and forms cytoplasmic bodies. TRIM21 recruits the proteasome to degrade the complexes, specifically depleting GFP from the cell. Inhibiting the proteasome with MG132 prevents TrimAway. Movie 2: Taking X-ray snapshots of the molecular structure of HIV-1 capsid hexamers and turning them into a movie helped us discover dynamic pores in the viral protein coat. These pores are controlled by the movement of a β-hairpin motif that opens and closes like the iris of an eye. We are currently investigating how TRIM21s unusual mechanism of ubiquitination gives it the ability to degrade any target, what regulates its activity, how it synergises with other immune receptors and what pathogens it protects against. We are also studying HIV-1 to understand how it utilizes cellular cofactors to promote infection and control capsid uncoating. eLife 7: e35335. doi: 10.7554/eLife.35335. eLife 7: pii: e32660. doi: 10.7554/eLife.32660. Cytosolic Fc receptor TRIM21 inhibits seeded tau aggregation. Proc Natl Acad Sci U S A. 114(3): 574-579. HIV-1 uses dynamic capsid pores to import nucleotides and fuel encapsidated DNA synthesis.